Join 0 others at play.skybattle.netClick to copy! We are currently working hard on the new features for Centrix. I have a little list here what we are doing atm! We are currently improving the server selector (plugin) because the old one is too outdated and bad. We recieved some suggestions/reports that the combat is not always working right. People are able to push or some of them are still experience some cooldown on items. This must be removed now because we installed a new plugin which is preventing this! This server just recieved a reset. A lot of things were missing such as the money-kills system and the levelings system. The money-kills system has been added back, but the levelings system is currently getting coded, which means that it will be added when it's done! I said it already today, but BedWars is ALMOST done, which means a full BedWars release. New features included stats (top winners and killers etc.) are now tracked. The BedWars update/release post will be posted soon! @ludozz, @kranendonk and I are currently working on the 'last' things of Prison. Simply said, making the ranks, adding the right permissions, testing and the crates. I am sorry, but we don't have a specific release date YET! We want to give you guys a spoiler already because it's taking a bit long time to release the new factions servers, Yeah, I said servers! We will have two different Faction servers. Why? @michael244 and @Sywo are thinking that this will be one of the best Faction resets ever. It's including bunch of new stuff and I am very happy with these two guys and their result from the new Faction server! A release date, nope you know use. We will announce it when we are finally done, xD. Hackers, old maps, y server, daily reports which we recieve from the SkyWars 'community'. 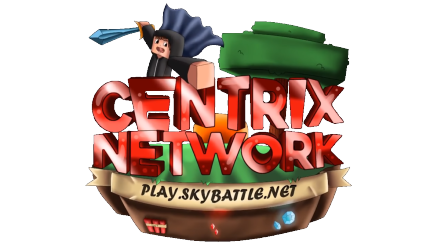 We have planned to revamp the complete SkyWars server, which means that everything will reset. New maps, updated things such as plugins, new features etc. will be added! It's true, we need a complete new website design. We are currently seeking a theme/website developer who can help us out! If you are intrested, send @didjee2 or me a PM please! People are also asking sometimes what our social media pages are, these are the official pages from Centrix! This was the update post for now! We hope that you will enjoy the features which will be added asap! Nothing fixed in eggwars? The compass (server selector) in the eggwars lobby does not work. Also, would you please bring back the old Centrix maps? I want a bit of 2016-17 nostalgia right here! Thanks in advance! I agree about the server selector, it is very old school and classic. I really love Sywo and michael's work on factions and these guys deserve a medal. This will be one of the best faction resets ever made since a long time. Please don't ask me to watch your appeal, apply or report. You need new graphics for the forum? We do need a new template / theme yes. You need a new staff rank. Is it going to be Op factions and normal factions or Tnt factions and mcmmo factions or Factions and Hcf ? If it's op fac i would play. Bring back old eggwars maps! @didjee2 @Jooster11 Make something innovative in kitpvp (Include other server though) . Take inspiration from Hypixel The Pit. This kind of innovative idea attract a lot of player to play and also make gameplay more fun. The current kitpvp is just too classic . Most cracked server have this gamemode It not going to attract more player unless you made it something special like The Pit . We should make something new that other server don't have. I mean, we will add suggestions if you give us them, and we like them. But we just do not get (any) (innovative) suggestions.